The Morning Stories crew was a bit concerned that we hadn’t heard from Bonnie Lee since we recorded A Lesson in Chinese. Turned out she was in Zambia. As she told us, the trip took her farther from home than she ever would have wanted. PS — She’s back home in Xi’an now, safe and sound. 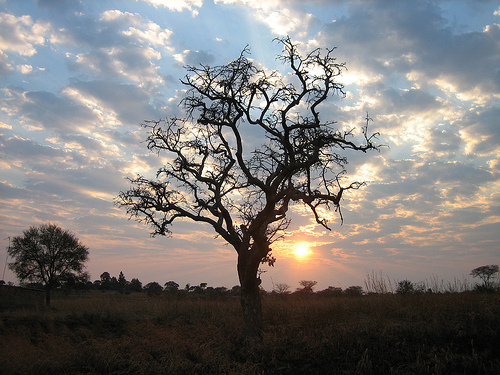 Tony Kahn catches up with Bonnie in the Morning Stories podcast called Escape From Zambia. It’s lovely hear from you. I came back to China in the early of November. I currently live in Xi’an now. My experience in Africa is very sad. Whenever I thought of this experience, I felt angry and sad. However I have to move on. In the course of time, I have learnt something which is very invaluable from this experience. I am proud that I have the ability to live on this difficult and overcome it eventually. I stop complaining and hating, instead of starting to forgive. As I learn to forgive someone, I feel so relieved. A new world opens to me. And it is so powerful. Sunshine comes back to my inner world, a good feeling is beginning to bloom. It is even hard for me to believe I could go through all difficulties. No TV, no internet, and newspaper, the only chance I got to know the world was to listen to BBC which was available in Zambia. I lead an isolated life there. The most beautiful moment was to watch the sky, and listen to the silence of the night. Writing became a part of my life. Words did not only record my life but also my vivid emotion. I indeed grow up although I paid high prices. The following is what I suffered in Zambia. I worked as a translator in a Chinese company in ZAMBIA . I got the job via internet in China. The profile of the company in the advertisement was promising. And the description of the payment and benefits were excellent. As I reached the company, I was so despairing. It was totally different from the picture that had described in the advertisement. I am the one of the first three employees in the factory of zambia. What I saw was a land with a building with nine rooms. The factory was just starting to build. Life condition was tough. Flies were everywhere, especially in the kitchen and washroom. The moment we arrived, the company made a policy, no going outside the factory twenty-four hours a day seven days a week. No Sunday. It was unreasonable and absolutely broke the work contract. I didn’t get paid in four months. But in the contract, it says each employee gets paid each month, and work 44hours a week. The worst thing was they didn’t apply for work visa and didn’t want to do it. Obviously the reason was the process of the visa cost a lot fortune. The job I applied was to work as a translator, but they asked to take another job as cashier as well. No extra payment. I worked in the company for four months, but only got one months salary before I left. I was insulted and threatened during the work period. Once the son of the director of the company came to talk to me in my room. It was 8pm at night. The reason he came to talk to me was to warn me not to go outside anymore, even the gate of the factory. The way he talked to me was very rude. Pointing to my face, hit the desk, shouted at me. I was insulted. He said: his father cheated me, made false information. However it was not his father’s fault. His father lived in zambia shortly then flied back to China to recruit people. Again he warned me no going outside, no Sunday. Finally, looked at his watch, he told me he took his leisure time to talk to me. He left at 3am in the morning. Two weeks ago, the director forced me to resign. The reason was I was not suitable to the job. And finally we reached agreement: pay me four months salary; and return me 5000yuan (deposit money); buy me one- way flight ticket to China. The following morning, everything changed. He forced me to write resignation report. I refused. He threatened me no resignation report, no ticket, no money. The afternoon of this day, the most strange thing happened. He told me the money I could get was 5000yuan, and a ticket. The old man broke his promise again. After the company fired me, I got another job in a local company. However the company refused to give my passport back. The company kept every employee’s passport. I know it is illegal. Finally I lost the job. But this was not enough. The man forced me to leave zambia in three days. I was hurt and insulted. This was what all I suffered in zambia. person you are. I look forward to speaking to you soon.